Sing your favorite songs with friends, strangers or the cast. 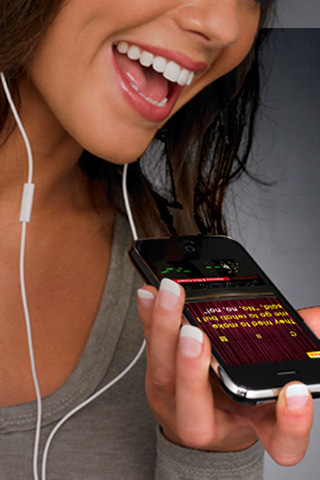 Glee will enhance your pitch and harmonize your voice while you sing. Share your top songs with friends to get Gleeks and earn more free songs, like just added “Bohemian Rhapsody”! iPod Touch 2G users, the iOS4 update causes audio problems. We are working with Apple to figure out a fix. Please wait to update to iOS4 if you can. If you are experiencing any audio glitches or sound dropping out, please help us out by emailing support@smule.com so that we can diagnose and troubleshoot the issue. ryanwags0: My wife has discovered the “glee” app. She is now in a world where I can’t follow her. She’s on her own now. lauralatch91: I have gleeks on my glee app :’) I have fans!! I am a STAR! japhun: this Glee app for iPhone is CRACKING ME UP!!! missriss89: I am beyond obsessed with this Glee app. I have to force myself to be productive instead of continuing to sing. Have it? Find me on there! xorosegarden: My song got posted for the effing world to hear. And my voice cracked at the end. FML. ozzerzCG: I got all excited cause I just found out I have two Gleeks on the Smule Glee app. Yep, dork status confirmed. The App bundles “Rehab”, “Somebody To Love”, and “You Keep Me Hanging On”. Earn gleeks by sharing your songs and unlock “Gives You Hell”, “Bad Romance” and “Bohemian Rhapsody” for free! Newly released! “Hello”, “Somewhere Over The Rainbow”, “To Sir With Love”, “Hello” and “Poker Face”. More songs added every week! Additional songs such as “Can’t Fight This Feeling”, “Imagine”, “I’ll Stand By You”, “Lean On Me”, “Taking Chances”, “Defying Gravity”, “No Air”, “Take a Bow”, “Dream On”, “Bad Romance”, “Beth”, “Total Eclipse of the Heart”, “Jessie’s Girl”, and more complete with lyrics, pitch timings and harmony arrangements for your voice, can be purchased within the app. All music available in the App is specially mastered and arranged. The unique pitch correction and vocal harmony software in Glee was developed by Smule for Glee and is not the same Antares Auto-Tune found in Smule’s I Am T-Pain App. Questions? Write support@smule.com or twitter @smule. * New ‘reverb’ effect on iPhone 3GS, iPod Touch 3G, and iPhone 4. Press the FX button on the sing screen to use it! * Thanks everyone for all your support and singing! We’re already working on the next update with more features that you’ve been asking for. Stay tuned! Earn gleeks and unlock songs such as Bohemian Rhapsody, Bad Romance and Gives You Hello, for free! Listen to people sing all over the world on the Glee globe. iPod Touch 2G users, the iOS4 update causes audio problems in the Glee app. We are hard at work trying to isolate the issue and figure out a fix. If you are experiencing any audio glitches or sound dropping out, please help us out bye emailing email us at support@smule.com so that we can diagnose and troubleshoot the issue. Follow @smule on Twitter for the latest updates!